Verdict - Ranveer Singh is the only saving grace in Dil Dhadakne Do! DDD begins in a very YJHD style where Ayesha Mehra (Priyanka) is packing the invitation basket for the wedding anniversary of her parents, which is going to be held on a cruise trip. Zoya seems to be too inspired from Ayaan, such that she kept the name Kabir handy for Ranveer and likewise she reads out a card that has only Kabir Mehra's name in RSVP (Major YJHD De Ja Vu moment at the very beginning of the film). In somewhat Karan Johar kind of style, the film tries to fit in a very Indian script on the high society celluloid, with wine and champagne, English delicacies, Louis Vuitton, Christian Louboutin with characters that speak Prada! DDD has a failing businessman, a spoiled yet soft hearted son, a neglected daughter who's in an unhappy wedlock, a housewife who's trying to come to terms with her husband's indifferent behavior and a dysfunctional family. Amidst a grand star cast consisting of Priyanka, Farhan, Anil Kapoor, Anushka, Ranveer and Shefali Shah, including Pluto Mehra (voice rendered by Aamir Khan), Ranveer Singh is the only saving grace in Dil Dhadakne Do! Even Aamir Khan's pseudo presence and irregular sermons as a dog fail to save the cruise from sinking. Anushka Sharma's dance number is a complete waste! The black mole and her famous lips add to the misery of the movie while Zoya revives the Band Baja Baraat kissing scenes yet again. Priyanka Chopra does manage hard to do justice to a pivotal role. The sibling relationship is the only relatable point in the movie, thanks to the ice-cream sharing scene where Ranveer tells Priyanka how the same ice-cream seems tastier when he eats it from her bowl than his own. The looks they exchange through their eyes while their parents fool the public with their lovey dovey lines are amazing. For the first time in many years, you'll love Ranveer as a normal boy where he puts just the right amount of energy in contrast to his hyper-active real life image, with a very slow moving script. I wish Farhan Akhtar had a longer role! The first half doesn't seem to end at all and the handful of good moments in the movie get marred by the longevity of a weak script. The last 20 minutes are a laughter riot and sum up the objective of the movie, but then it gets too late for Indian audiences to keep up with the pace. Jumping off a cruise to get the girl is to DDD what gate crashing the airport check-in counter is to all Bollywood movies. Dil Dhadakne Do does have its enjoyable moments in scenes like the one at the hospital, where Kabir Mehra (Ranveer) says asli baat toh koi karta nahi hai is family mein! Another one with Ayesha Mehra's (Priyanka's) husband and mother-in-law is one amazing scene where the parents don't surrender to an overpowering son-in-law. The film has more life lessons in its dialogues coming from the strict father, played convincingly by Anil Kapoor and Pluto Mehra. The only performances that stand out come from Anil Kapoor, Shefali Shah, and of course Ranveer Singh. You want to see more of him, while you wait for the movie to pick up pace, but that sadly happens only towards the end. There's no guess work happening in DDD, because the audience will remain clueless about what's going to happen next until the last 20 minutes, which is good for suspense thrillers, not for this one. Zoya Akhtar's cruise trip did not sail smoothly this time. DDD is a curious case of a stellar star cast gone wasted due to a sluggish script. With crisper first half and more energetic songs like Galla Goodiyan, DDD could have been a lovely film which had the potential to stay longer with the audience. A must watch.. But strictly not for d masses..
Dil Dhadakne Do.. The movie takes us into the lifestyle of a dysfunctional Delhi based Punjabi business family. Anil Kapoor playing Kamal Mehra, is a wealthy billionare businessman who never shy's away from boasting the efforts and hard-work he has put in to reach this level. Shafali Shah plays Kamal Mehra's wife Neelam, who is a high flying socialite. Ranveer Singh playing Kabir Mehra, is the son of Kamal Mehra who is not able to match his Dad's steps when it comes to his family business. Priyanka Chopra, plays the role of Ayesha Mehra, the daughter of Mehras and wife to Manav played by Rahul Bose. Ayesha is a young enterpreneur in Mumbai who has her name in the Forbes Top 100 young businesswomen and at the same time is unhappy in her married life and is willing to divorce her husband. Kamal & Neelam Mehra have planned to invite their family and close friends to a cruise to celebrate their 30th wedding annievrsary. The ship sails and Zoya takes us for a ride into the movie's characters with their internal tiffs and compatibility differences. Soon we are witnessed to beautiful locales and some breathtaking scenery in European continent. On the ship, enters Anushka Sharma playing Farha Ali who is a dancer in the ship's dance troupe. Kabir gets attracted to Farha right from the onset and the two develop a more cohesive bond of love. Meanwhile, Kamal Mehra is trying to make his son marry the daughter of his super rich business friend Lalit Sood on the agreement that Sood will bail his firm Ayka out of losses. However destiny has other plans and nothing happens as desired. The movie takes a dig into the married life of Mehra's who share a relation full of show off's and devoid of any love and affection. Just before the interval, the movie introduces Farhan Akhtar as Sunny Gill who is a reputed journalist in 'The Geographic' and the son of Kamal Mehra's business manager. He shared a close relatioship with Ayesha Mehra before he was sent to the United States for further studies. Will Kabir get his lady love? Do Ayesha and Sunny re-invent their lost relationship? What happens next is for you to explore in the movie as you travel along with the stellar start cast showcasing the glitz and glamour on this royal cruise. Anil Kapoor as the rich and stylish Kamal Mehra is full of energy and delivers a power packed performance. Shafali Shah looks convincing of what was desired of her. Ranveer Singh uses the wit to his advantage and is the captain of this ship who always keeps the film floating with his impressive performance. Priyanka Chopra justifies her role and looks gorgeous throughout the movie. Anushka Sharma though does not have much to play but is flambouyant in her character. Farhan Akhtar as the cool and independent young journalist plays a cameo which lifts the movie with his screen presence. One of the scenes at the cruise bar which results in some altercation between him and Rahul Bose deserves a special mention for the way it was crafted with some aptly suited crisp dialouges. Rest of the supporting cast including Rahul Bose, Zareena Wahab & Parmeet Sethi do a fine job with their part. Last but not the least, Pluto Mehra who is the pet dog of Mehra's and also the narrator of the movie makes up for an important part in the story. Full credit needs to be given to the film's director Zoya Akhtar for bringing together an ensemble start cast and defining the roles for each of them to near perfection. She is by far ahead of all her contemporaries when it comes to depicting relationships in any form. The movie has some breezy fun moments that will keep a smile on your face for most part of the runtime. The movie revolves around it's prime characters who look so high profile and yet appear to be realistic when it comes to their family relationships and the bonding issues within them. Zoya dispalys the tiffs and arguments within the family with sheer honesty. She is one of the rare director's who has the ability to make the viewer peep into the character's mind and start empathising. It has those moments in some scenes wherein there are no dialogues but just a soothing background score that adds to what the director wants to portray with the perfect blend of emotions. The one thing thing that could have added to the movie's entertainment value would have been Shankar-Ehsan-Loy's music which is not upto the mark. Most of the songs look fine on the big screen but do not have the charm to make it to your playlist. One will tend to compare this film with the earlier Zoya Akhtar film " Zindagi na milegi dobara" which was a shade better in all departments. This film is more over the top, loud and has gloss over the characters making them identifiable only with the small number of privileged page 3 class of this country. Nevertheless the entertainment quotient is high and hence people will like it no matter what critics say. c) his laid back, happy go lucky son Ranveer Singh who is not interested in the family business and wants to make a career in aviation since he holds a pilot's licence. To make things worse he falls for dancer Anushka Sharma who is, horror of horrors, a Muslim. d) Farhan Akhtar who is Priyanka's earlier love interest and who happens to be the son of Anil's manager. Problems for Anil Kapoor arise because son Ranveer refuses to join family business,wants to marry dancer Anushka and not the rich girl choice of parents. Also because Anil does not approve of daughter Priyanka wanting to divorce her husband. In both cases it is the middle class syndrome of " Log kya kahengay" which is the stumbling block. Director Zoya Akhtar keeps the proceedings interesting with some racy dialogue and attractive visuals. There is also a well shot dance number where everyone dances. It is definitely the highlight of the film.The scenes are presented gorgeously most of the time. A long scene of family disccssions where skeletons tumble out is done well. The dance with Ranveer and Anushka is appealing. All actors have pitched in with good performances. As the harassed patriarch caught between tradition and family wishes Anil Kapoor has done well. Ranveer is surprisingly good in his restrained avatar as a soft lover boy. Priyanka as the meek and submissive daughter caught in a unhappy marriage is impressive. Shefali Shah also does well as Anil's wife. Her cake eating scene (due to her jealousy) has been done realistically. Rahul Bose is a piece of perfect casting. Both Farhan and Anushka are likable in interesting cameos. 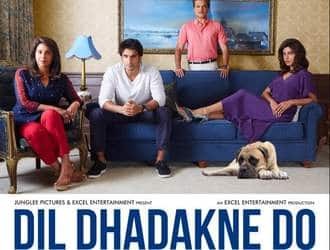 Dil Dhadakne Do Is Zoya Akhtar's Finest. Amidst all the negative reviews, my review for Dil Dhadakne Do might come as a surprise. I really loved the film. At first, I was a little skeptical about watching the film since I hadn't liked any Zoya Akhtar films before this & I also came to know that the film is 3 hours long. As soon as I entered the film & it started, my skepticism was gone. I was enjoying the film. I didn't realize how we reached the interval because it was so entertaining that 1.5 hours passed so quickly. The 2nd half also got over without me knowing because the film itself is so entertaining. The story is about a rich family of Mehra's. Everyone in the family is unhappy but on the surface & to others, love & hypocrisy is shown. Anil Kapoor & Shefali Shah's 40th Anniversary is celebrated in the cruise around Europe. All the family drama is inside the cruise between the people. You might think that the film is about rich people & their problems but these problems are faced by every children, whether rich or poor, every married couple & everyone else. The message given through the film is for all. It's up to you how you want to perceive it. Ranveer Singh & Priyanka Chopra stands out in the acting department. Farhan Akhtar & Anushka Sharma have small roles but they leave their impact. Especially Farhan Akhtar & Rahul Bose's one small conversation on Feminism conquers Queen & Tanu Weds Manu Returns. Anil Kapoor, Shefali Shah, Parmeet Sethi & other actors have done their job very well. Direction is serene, music is likable. Story is common but the message is loud & clear. Zoya Akhtar needs a standing ovation for this film.